I receive you joyfully and thank Cardinal Jean Louis Tauran for his greeting to me, also on your behalf. We meet at the end of your Plenary Assembly, during which you treated “The Role of Women in Education Towards Universal Fraternity.” Certainly not lacking was a very enriching discussion on this subject, which is of primary importance for humanity’s journey towards fraternity and peace, a journey that in fact is not given for granted and linear, but marked by difficulties and obstacles. We see today, unfortunately, how the figure of woman, in as much as educator to universal fraternity, is obfuscated and often not recognized, because of the many evils that afflict this world and that, in particular, affect women in their dignity and in their role. Women, and even children, in fact, are among the most frequent victims of blind violence. Where hatred and violence take over, they lacerate families and society, impeding woman from carrying out, in communion of intentions and actions with man, her mission of educator in a serene and effective way. Reflecting on the subject you addressed, I would like to pause in particular on three aspects: to appreciate woman’s role, to educate to fraternity and to dialogue. To appreciate woman’s role. In today’s complex society, characterized by plurality and globalization, there is need for greater recognition of woman’s capacity to educate to universal fraternity. When women have the possibility to fully transmit their gifts to the entire community, the very way in which society is understood and is organized is positively transformed, coming to reflect better the essential unity of the human family. Here is the most valid premise for the consolidation of a genuine fraternity. Therefore, the growing presence of women in social, economic and political life at the local, national and international level, as well as ecclesial is a beneficial process. Women have full right to insert themselves actively in all realms, and their right is also affirmed and protected through legal instruments where they are revealed as necessary. It is about enlarging the spaces of a more incisive feminine presence. There are so many, many women that, in the tasks carried out daily, with dedication and conscientiousness, with courage at times heroic, have put and put to fruit their genius, their precious traits in the most varied, specific and qualified competencies united to the real experience of being mothers and formators. To educate to fraternity. Women, in as much as educators, have a particular vocation, capable of having new ways of acceptance and mutual esteem be born and grow. The feminine figure has always been at the center of family education, not exclusively in as much as mother. Women’s contribution in the field of education is inestimable. And education entails a richness of implications be it for the woman herself, given her way of being, be it for her relations, given her stance on issues of human life and of life in general. In short, all – men and women – are called to concur to education to universal fraternity that is, in the last analysis, education to peace in the complementarity of their diverse sensibilities and roles. Thus women, connected intimately to the mystery of life, can do much to promote the spirit of fraternity, with their care for the preservation of life and with their conviction that love is the only force that can make the world habitable for all. In fact, women often remain the only ones to accompany others, especially those who are weakest in the family and in society, the victims of conflicts and all those that must face the challenges of every day. Thanks to their contribution, education to fraternity – by its nature inclusive and generating of bonds – can overcome the culture of rejection. Dialogue. It is evident how important education to universal fraternity – which also means to learn to build bonds of friendship and respect — is for the field of inter-religious dialogue. Women are committed, often more than men, at the level of the “dialogue of life” in the inter-religious ambit, and thus they contribute to a better understanding of the challenges characteristic of a multi-cultural reality. However, women can also insert themselves with full right in exchanges at the level of religious experience, as well as at the theological level. Many women are well prepared to address meetings of inter-religious dialogue at the highest levels and not only on the Catholic side. This means that women’s contribution is not limited to “feminine” arguments or to meetings among women alone. Dialogue is a path that woman and man must follow together. Today it is more necessary than ever for women to be present. Woman, possessing peculiar characteristics, can make an important contribution to dialogue with her capacity to listen, to receive and to open herself generously to others. 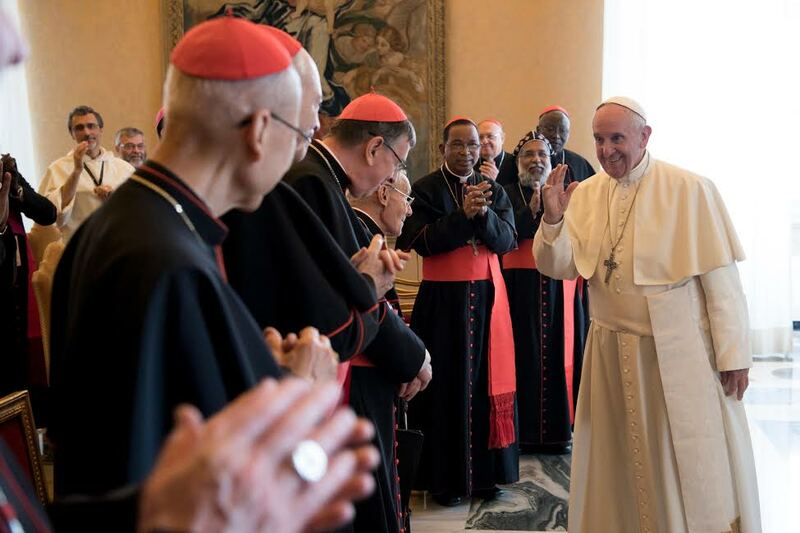 I thank you all, Members, Consultors and Collaborators of the Pontifical Council for Interreligious Dialogue, because you carry out a precious service. I hope you will continue to weave the delicate fabric of dialogue with all seekers of God and men of good will. I invoke upon you an abundance of the Lord’s blessings, and I ask you, please, to pray for me.